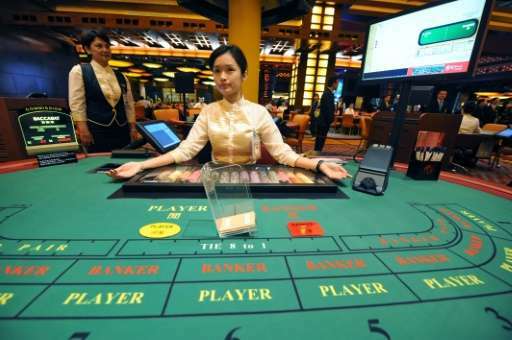 Singapore will allow limited online betting in tightly controlled conditions, the government said Thursday, as it eases a sweeping law banning remote gambling. The Ministry of Home Affairs has exempted state-linked Singapore Pools and the Singapore Turf Club from legislation that blocks access to gambling sites and stops electronic payments to them. Both operators will launch online gaming services in the next two months but cannot offer casino-style games or poker, the ministry added. They also face fines of Sg$1.0 million ($734,000) for every guideline breach. Sports betting, especially on top European football league matches, is deeply entrenched in wealthy Singapore, which has two casinos. "While our blocking regime is one of the most comprehensive in the world... it is not straightforward to eradicate remote gambling totally," the ministry said. "A complete ban would only serve to drive more remote gambling underground, making it harder to detect, and exacerbate the associated law and order and social concerns," it added. "A tightly-controlled exempt operator regime mitigates such concerns." It said the approach was not unique to Singapore as Hong Kong and Norway also allow regulated authorised operators. Several hundred gambling sites—including those based overseas—have been blocked since the ban took effect last year, the ministry said. In a report from July 2015 the Straits Times newspaper said Singapore's online gambling industry was estimated to have raked in SG$500 million the previous year from gambling sites based locally and overseas before being shut down.